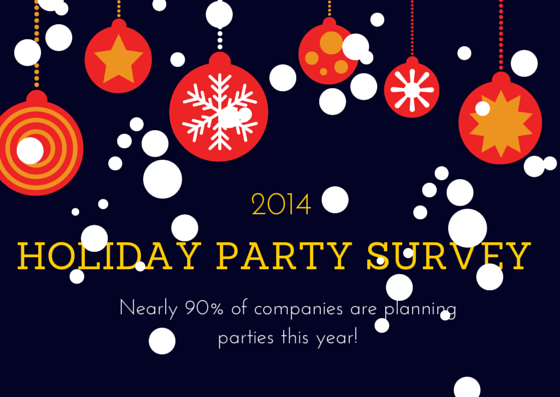 2014 Holiday Party Survey: Nearly 90% of Companies Planning Parties This Year | Challenger, Gray & Christmas, Inc. Bolstered by an economy that has made significant strides over the last year and healthy corporate profits, a new survey shows that more the nation’s employers are ready to break out the party hats this holiday season. In a survey among approximately 100 human resources professionals, 89 percent said their companies are planning holiday or year-end parties this year. That is up from 82 percent in 2012 and 68 percent in 2011, according to Challenger, Gray & Christmas, Inc., the global outplacement consultancy that conducted the poll. 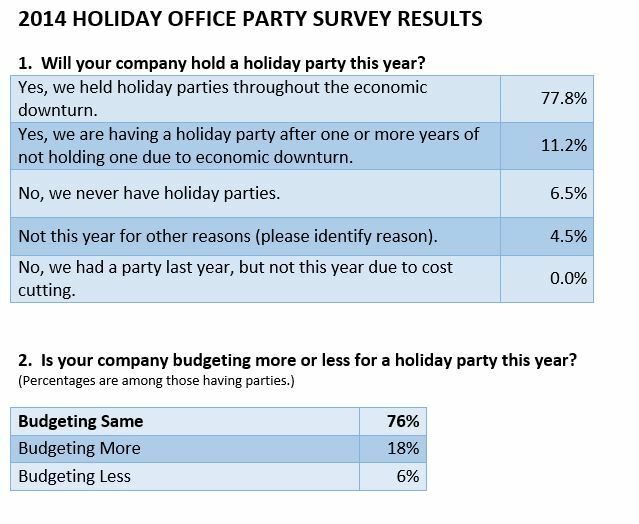 Not only are more firms planning parties, but nearly one in five (18 percent) plan to spend more on this year’s festivities. While most are upping their budget by less than 5.0 percent, one-third are increasing spending limits by 5 to 10 percent. “This is the fifth year of the recovery, but for some employers and many of their workers this is the first year it actually feels like one. We saw solid hiring gains throughout the year; wages increased, albeit slightly; corporate profits are strong; and consumer confidence is at pre-recession levels,” said John A. Challenger, chief executive officer of Challenger, Gray & Christmas. “The memories of the most recent and very painful recession still may be too fresh for most companies to return to the type of decadent parties that were more common prior to the economy’s meltdown, but there clearly is a sense that it is okay to loosen the budget reins a bit to hold a respectable holiday party,” said Challenger. “After all, holiday parties are a relatively low-cost way of building morale and rewarding employees for a year of hard work. For smaller companies, the holiday party is simply an extension of a more family-like relationship that often exists between these employers and their employees,” he added. 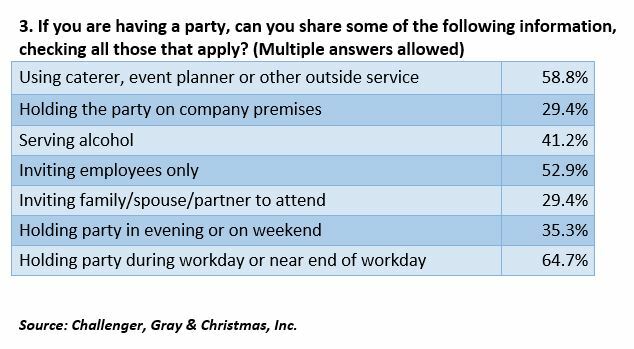 One of the most significant changes in the holiday party survey since it was last conducted in 2012 is the decline in the percentage of employers planning to host their holiday party company premises. In the latest poll, less than 30 percent (29.4) of respondents said their company party would be on-site, down from 55 percent in 2012. About 60 percent of companies are relying on a caterer, event planner or other outside service to plan and execute their year-end function. Just over 40 percent plan to serve alcohol. While the availability of alcohol may be a plus, the best news for employees could be the fact that 65 percent of companies plan to hold their party during or near the end of the workday. “A party that start during or near the end of the workday is basically the equivalent of being paid to have a good time with your co-workers, which is always appreciated. Of course, employees have to be careful not to party too hard. It is, after all, a work function and managers, as well as the company’s top executives, are there and most likely will not look kindly upon unprofessional behavior,” said Challenger. “However, employees should not simply stand in the corner in an effort to stay off the radar. It is equally important to remember that these events also offer great opportunities, such as socializing with senior executives with whom you do not interact on a daily basis. Make an effort to break away from your comfort zone and introduce yourself to those who might help your career,” he advised. Attend other companies’ parties: 54 percent of company parties are employees only. If a friend invites you to his or her company party, you should go. It is an opportunity to expand your professional network, which is critical in this era of downsizing and job switching.